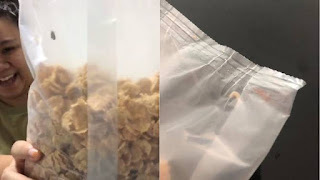 Kellogg’s on Tuesday (Jul 31) said it has introduced improved cereal bags following an insect infestation in several packs of Kellogg’s Special K cereal bought in Singapore. In a statement, Kellogg’s assured the public that their “number one priority” is the quality of their food. "Our strong quality programmes identified that a small number of cereal bag seals had been weakened and may open when mishandled during distribution. We proactively addressed this issue and took corrective action and our food now has new improved cereal bags. There are no affected products on shelf," a spokesperson added.